The Japanese attack on Pearl Harbour on 7th December, 1941, was the beginning of a number of Japanese offensives throughout the Pacific, intended to create a Japanese controlled Greater East Asia Co-prosperity Sphere, with the pretext of ‘liberating’ the colonies of the Western Powers in South East Asia. On 8th December, Japanese forces invaded Thailand and Malaya from Hainan Island and quickly overran all opposition. Thailand capitulated on 13th December, releasing Japanese forces to capture Singapore and invade Burma. 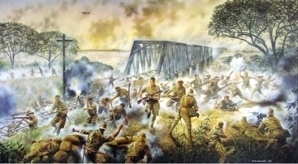 On 15th December, 1941, the Japanese 15th Army, assisted by Burmese nationalists, invaded Burma in order to take Rangoon and cut off the main Allied supply line to Chiang Kai-Shek’s Chinese Nationalist forces, which had been resisting the Japanese Army in China since 1936. British and Indian troops were sent from India to reinforce the small and scattered units in Burma, including the 2nd Battalion, The Duke of Wellington’s Regiment, who were moved from Peshawar, on the North West frontier of India, by train and ship to Rangoon. They arrived on 14th February and were deployed on the far side of the Sittang River on 20th February to reinforce 17th Indian Division who were facing overwhelming odds in holding the Japanese advance. The Sittang was a fast flowing river 600 – 1000 yards wide, crossed by a railway bridge which had been adapted to carry vehicles, and was the Divisional withdrawal route. By the 22nd the Divisional Commander decided that he had little choice but to order the demolition of the bridge. This was blown in darkness under heavy fire and was only partially demolished leaving ⅔ of his Division on the far side. The remnants of 2DWR and 1st/3rd Gurkha Rifles on the far side were able to re-secure the bridgehead to allow many members of the Division to continue to cross the river by ropes attached to the bridge. Many others swam or used rafts. By the end of the battle the equivalent of one brigade had been lost, either killed, drowned or taken prisoner. The remainder arrived on the west bank with little or no equipment and only some with their personal weapons where they were re-equipped as well as possible before being re-formed into units to continue a fighting withdrawal. The withdrawal covered nearly 1,000 miles, mostly on foot, over three months in the face of a superior enemy and cut off from outside assistance. They finally reached Imphal in India in May It was the longest withdrawal in the history of the British Army. By 31st May 1942, the Japanese 33rd and 55th Divisions had reached the Indian border where they were finally held. They were planning to invade India, to foment an uprising against the British colonial power and draw the whole of India into the Greater Co-prosperity Sphere, with the assistance of Bose’s Indian National Army. The Allies, British, Indian, West African, East African, US and Chinese forces, raided and harried the Japanese in Burma, particularly in Arakan, during the 1942-43 dry season. In addition a joint US/Chinese offensive in October, 1943, and ever larger Chindit Column operations, forced the Japanese to launch an offensive, Operation U Go, to attempt to take the strategically important bases of Imphal and Kohima in March, 1944. Both towns were besieged but a strengthening British presence, with air and artillery superiority, halted any further Japanese penetration into India and, after fierce fighting, particularly at Kohima, the Japanese began to withdraw. The 2nd Battalion, The Duke of Wellington’s Regiment, had regrouped in India after the long retreat and became part of the 23rd Independent Infantry (Chindit) Brigade. The Battalion was formed into two columns, 33rd and 76th Columns, in late 1944, and both columns were in action at Kohima and Imphal, operating on the Japanese flanks and behind their lines, until the Japanese withdrawal in July, 1944. Elements of 146 Regiment Royal Armoured Corps (9th DWR) were also in action at Ramree Island, Arakan, from January to March, 1945, supporting the 26th Indian Division. By February 1945, bridgeheads had been secured over the Irrawaddy River and the Japanese were being steadily forced out of Burma. An amphibious assault on Rangoon in May, 1945, secured the last strategic objective of the campaign.